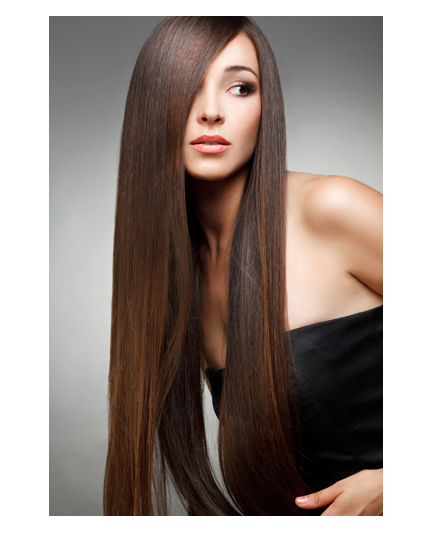 Experience the best hair extensions services in Milwaukee at iLLustria Salon! Our stylists have the advanced training to give you outstanding results, and we exclusively use natural, high-quality Remy extensions to infuse instant glamour to your style. Our hair extensions can also be used to add length, volume or create beautiful highlights or color, which will give your overall look gorgeous dimension. Most importantly, our application methods are safe and maintain the integrity of your hair. We specialize in many different types of custom extensions including tape in, sew in, fusion, microlink and more. Our custom clip in extensions imported from Peru are also available, so that you can add dramatic length and amazing beauty to your hair. Fantasy colors and other artistic effects can be placed in your hair for additional touches. *All hair extension prices are upon consultation. During the consultation you will discuss application techniques, prices and maintenance for your custom extensions. All extensions are $75 an hour. Babe is a high quality line of 100% human hair extensions available in a variety of colors. No heat, no glue and no mess are involved in attachment, and Babe hair has a beautiful, radiant smooth texture without a synthetic silicone coating. Babe hair extensions from iLLustria Hair Salon in Milwaukee can instantly transform your hair from bland and ordinary to absolutely fabulous. Babe extensions are attached without the need for glue, clips, or beads for a look that is seamless to the touch and undetectable in your hair once installed. We use a variety of application methods at iLLustria based on individual client needs and preferences. Every strand of your hair will be enhanced with the 360 degree movement of I-Tip Extensions. Your hair will be transformed with amazing volume, length, and versatility. You can wear it up or down and no one will know your extensions are not actually your real hair. I-Tip installation is a snap! Microbeads are clamped to securely hold each hair extension strand in place. That means your hair can be long and full without the worry of slippage. This amazing method has absolutely no chemicals, no glue, and no heat so there is no harm to your hair. You will love the wide variety of hues from which you can choose, ranging from deep brunettes to warm blondes and even pinks, blues, teals and other fantasy colors. Colors can be combined to create custom color combinations. You can opt for a shade that matches your natural hair or you can choose a shade lighter or darker to give your hair multi-dimensional depth and natural highlights and lowlights without a chemical process. Also, since Babe extensions are created from 100% human hair, your hair can be colored using one of our high quality L’Oreal color services at iLLustria. How do I brush my hair? We highly recommend using a hair extension brush created specifically for extensions. Brushes that you purchase from a department store will not provide the same results. A hair extension brush prevents tangling and is specially designed so it won’t pull or catch on the application points. For best results, brush 2 to 3 times a day and before showering or wetting your hair. Hold the roots of your hair with one hand while brushing in a downward motion with the other. Brush gently, and be particularly careful when brushing near the point of attachment. Yes they can! If you would like to have your hair colored, our color specialists will be happy to help you select the perfect hue. We can choose a semi- or demi- permanent hair color from our L’Oreal line of professional color formulas to deliver gorgeous results. 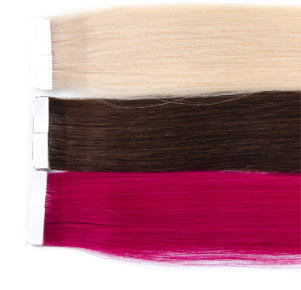 We suggest keeping your color within two shades of the original color of the extensions. Contact one of our specialists at iLLustria Hair Salon in Milwaukee for a consultation. Cinderella creates beautiful, top of the line, remy hair additions that will add volume and length to your existing style. Available in over 70 different colors and 3 different hair textures for outstanding variety and options. Our Milwaukee hair extensions are not just for adding length. You can achieve volume, texture, color, highlights and color accents without the need for a chemical service. Instead of waiting years to have the long beautiful hair of your dreams, you can have gorgeous tresses in one hair salon appointment! Cinderella Hair Extensions will give you instant gratification. All Cinderella Hair is 100% Remy Hair, which means the hair cuticle is facing in the same direction. This allows for easy maintenance and prevents tangling and matting. Remy Hair is easy to blend with your own existing hair and gives a natural healthy appearance. With proper care and maintenance, Cinderella extensions will last between 4 and 6 months. Can I color or perm my extensions? 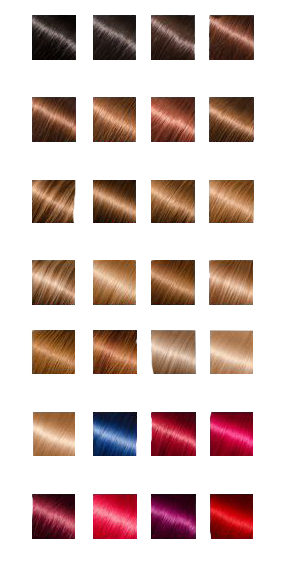 One of the advantages of the Cinderella line is that the hair is available in over 70 colors. This means that there is already a fabulous color selection, allowing for beautiful color effects without a chemical service. One of the stylists at our Milwaukee hair salon can match your existing color or add a contrasting color for highlights or color accents. If you want to color your hair and your extensions after they have been applied, please consult with one of our specialists. Do not use an over the counter hair color product on your extensions. What textures and hair types are available? Cinderella extensions are available in 3 textures (fine, medium & coarse) and 3 hair types (straight, wavy and euro wavy). We can match a color, texture or hair type that is perfect for you. Depending on the application method used, your extensions will need to be removed by one of the hair extensions specialists at our salon. A gentle shampooing will remove any traces of bond residue and prepare your hair for re-application. How do I maintain and style Cinderella Hair? Your stylist will recommend the proper products and tools needed to maintain your extensions. You will need a special brush created for extensions, and a gentle shampoo and conditioner for cleansing. Can I use heat styling tools? Blow dryers, curling irons, hot rollers, flat irons and other heat styling appliances can be used on all Cinderella Hair Extensions. Keep heated surfaces away from the scalp and bond areas for best results. Excessive use of heat styling tools and blow dryers can cause your hair to become dry and stripped of moisture. For best results, use a leave in conditioner and use heat tools sparingly. Can I color my hair after Cinderella Hair Extensions? Yes, but we recommend having your color or root touch-up at least 1 week before your initial application. Your regular hair color maintenance will be discussed with your stylist. We do not recommend coloring your hair at home. If you would like to color your hair, please consult with one of the hair color specialists at our Milwaukee hair salon. Will my hair extensions fall out? Everyone’s hair sheds naturally about 50 – 100 strands per day. This is a normal occurence and since extensions are attached to your hair, you may experience some hair extension shedding from time to time. Save any strands that fall out and bring this with you to your next appointment. For additional information about Cinderella Hair, make an appointment with one of our specialists at iLLustria Hair Salon in Milwaukee. We have the best hair extensions in the Milwaukee area! Answers to some of the most frequently asked questions from our Milwaukee hair extensions clients. This depends largely upon the type of extensions that you plan to receive as some methods of application will take longer than others. Application methods can vary from tape in, clip in, and other techniques. The amount of time can vary from an hour to three hours. What should I do to my hair before coming to the salon to have extensions installed? Before coming to our Milwaukee hair salon for your hair extensions, you should make sure that your hair is clean and free from any oils and build up. Clean hair will ensure that your hair extensions stay in securely. Hair extensions need gentle cleansing. If possible, use a sulfate-free shampoo and conditioner. Shampoo gently with your head tilted backwards so that the water runs down the length of the extensions. Use gentle motions and avoid scrubbing or rubbing your scalp harshly. After shampooing, use a great moisturizing conditioner on your hair. Apply the conditioner to your extensions from the mid-section to the end, avoiding the roots. You can also use a leave-in conditioner to add an extra dose of hydration. A leave in conditioner will help to protect your extensions and seal the hair cuticle. How often should I brush my extensions? Three times a day is recommended. This will help to distribute natural oils and also reduce tangles. Always start from the tips and work upwards, holding the roots with your other hand. You can use a special loop brush made just for extensions or a wide tooth comb. Your hair extensions will last for about 8 weeks before they need to be adjusted. As your hair grows, your hair will grow and take the hair extensions with it. You can schedule regular maintenance appointments at our hair salon, and we will adjust your extensions and move them up closer to your scalp. Can I use oil based products on my extensions? No, we recommend that our hair extensions clients do not use any oil-based products on their hair. In some cases, oil can affect the bond of your extensions, and oil-based products should be avoided. Can I color or perm my hair after receiving extensions? We suggest that you consult with one of the stylists at our Milwaukee hair salon first. Over the counter hair color or perms should never be used on your hair extensions. Our master colorists at iLLustria Salon will be happy to make specific recommendations for the type of hair extensions that you have chosen. Can I use hairspray or styling products on my extensions? If you use hair spray or other styling products, try to avoid those containing alcohol. (Alcohol can be very drying to the hair.) Limit styling products such as hair sprays, mousse and gel if possible as they can make your hair dry and can cause your hair to tangle. Styling products can also create build up on the hair. If this occurs, use a clarifying or chelating shampoo once or twice a month to remove build-up and residue. Can I use a leave-in conditioner? A leave in conditioner can be used on a daily basis and is an excellent way to give your extensions a healthy dose of moisture and protection. Even if you do not wash your hair every day, you can still rinse your hair, lightly towel dry it, and use leave-in conditioner. Yes, you can enjoy time in the pool with extensions. Just remember to wash your extensions thoroughly after swimming to remove all of the chlorine. Use a clarifying shampoo and acid balanced conditioner to cleanse the chlorine residue from your hair. Can I curl and heat-style my extensions? Yes. 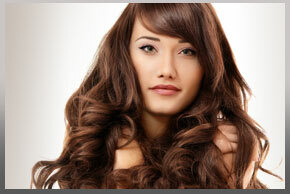 Your new hair extensions from our Milwaukee hair salon can be curled and styled just like your normal hair. If you’re using a curling or flat iron, the key is to use low heat settings and use a heat protectant spray. You should actually be doing this on your natural hair anyway to prevent damage and breakage. Make sure not to get the heat tool too close to the point of attachment. You can also get great curls without heat. Just wash and moisturize the extensions and then roll the hair into Velcro Hair Curlers. Let your hair dry, and then take out your curlers and do any necessary touch-ups and re-curls, and you’re good to go! Remy hair is the best hair available. 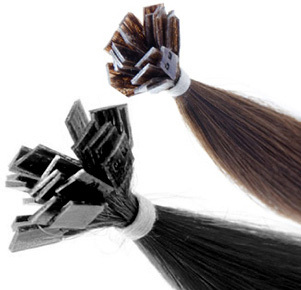 Remy hair extensions are made from high quality natural human hair that has been carefully selected to ensure that the hair cuticles are all going in the same direction from root to tip. This allows for easy styling and less tangling. Extensions that do not use remy hair are created from hair that has been arranged haphazardly with the cuticle on some strands of hair running in one direction while the cuticle of other strands runs in another. When this occurs, matting and tangling occurs. It can be difficult to tell the difference in hair extension quality so it is important to choose a reputable salon in order to make sure that you are receiving top quality. iLLustria Salon is passionate about using only the best remy hair extensions for all of the services at our Milwaukee hair salon. How often will my hair extensions need to be maintained? We recommend that our clients return to our hair salon two weeks later for a follow-up visit after they receive their extensions for the first time. At your appointment, we will check the extensions to make sure that they are still in excellent shape as far as attachment and care. After your first follow-up visit, you will need to return to the salon every few months for maintenance on your extensions. As your natural hair continues to grow, your extensions will need to be adjusted to continue to look beautiful and undetectable. Can I go to bed with my hair wet? You should make sure that your extensions are completely dry before going to bed at night. If your hair is wet when you go to sleep, tangles will occur. We suggest that you dry your hair and then put your extensions in a large, loose braid for the night. What kind of brush should I use for my extensions? In order to keep your extensions looking beautiful, we highly recommend using wide tooth combs and special brushes such as a loop brush created specifically for extensions. A regular brush will not give the same type of results and inferior quality brushes can damage your extensions. Always begin brushing your hair from the bottom, carefully working your way upward. Make an appointment with one of our specialists at iLLustria Hair Salon for the best hair extensions in Milwaukee! Our Milwaukee hair extensions are an exceptional way to add volume, length and style to your hair. Now it’s easier than ever to have the hair of your dreams. With a fabulous selection of colors, lengths, textures and attachment methods, you can have a completely customized look designed just for you! Your hair can blend with your existing hair color or your can achieve dramatic effects with contrasting colors and hues. If your hair will allow, it is best to shampoo hair extensions every other day instead of shampooing daily. Before shampooing, use a wide tooth comb or a special brush made specifically for hair extensions (such as a loop brush) to gently and carefully remove tangles from your extensions. Start at the ends and gently work your way up, brushing or combing in a downward motion. Use a mild, gentle shampoo. Over the counter shampoos should be avoided as well as shampoos with harsh lathering ingredients. Choose a sulfate free shampoo if possible. Shampoo with your head tilted backwards under the shower so that the water can run down the length of the extensions. Avoid using vigorous rubbing or scrubbing motions which can cause tangles. When conditioning, avoid the scalp area and just condition the hair from the midshaft down rather than the scalp. When rinsing, be sure that all the shampoo and conditioner residues are washed out. 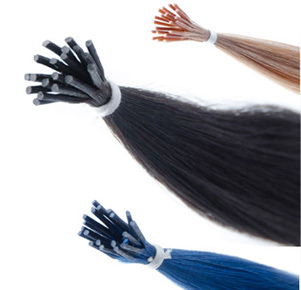 Even though hair extensions are real human hair, they do not receive nourishment from the scalp like your normal hair. Keeping your extensions moisturized is key. Leave in conditioners are great for hair extensions. A leave in conditioner can be applied after shampooing and will add protection and a healthy dose of hydration each day. Especially concentrate on the ends. Check the ingredients of your styling products and avoid those containing alcohol. Alcohol can be very drying to the hair and it can also lead to tangling. Styling products can also create build up on the hair. If your hair has been exposed to large amounts of gel, mousse or hair spray, then use a gentle clarifying shampoo once or twice a month to remove build-up and residue. Heat should be used carefully on your hair. High heat, over drying, and excessive use of irons can shorten the life span of your hair. If possible, limit the use of blow dryers, flat irons and curling irons as well as heat rollers. If you want to curl your hair, try steam rollers instead of curling irons. For flat irons, use an ionic ceramic iron if possible. It is best to use a flat iron that has a temperature gauge. Test a section of your hair and set the temperature gauge at the lowest setting that will still provide good straightening results. Before you start, brush your hair well, divide it into sections, and spray each section with a thermal protection spray before you use the flat iron. When you sleep, there are several methods that you can use to keep your hair extensions from tangling. Extensions can be braided or secured into a very loose ponytail so that they will stay nice and neat while you sleep. Never go to bed with your hair damp. You can also wrap your hair with a satin scarf or use a satin sleep cap or a satin pillow case to prevent friction. Visit iLLustria Hair Salon for the best hair extensions in Milwaukee!